With back-to-school nearly upon us, it’s a good time to benchmark engagement and inform campaign decisions based on what’s happening across industries. Epsilon's Q1 2018 email trends and benchmarks report helps; with quarterly aggregated data from over 12 billion emails sent by Epsilon clients in North America, across multiple verticals. What happened in Q1 2018? Unique open and click rates in Q1 2018 saw an increase over Q4 2017 as well as Q1 2017, meaning brands across industries were effective in reaching and engaging individuals through their email marketing efforts. The Q1 2018 Business as Usual (BAU) email trends and benchmarks analyzed performance trends by industry and message type. These metrics offer insight into how the average company performed across multiple industry categories. The Q1 2018 open rate of 33.1 percent was slightly more than last quarter (32.1 percent), and in line with Q1 2017 (33.5 percent). Coming out of Q4 2017, open rates increased one percentage point and click-through rates increased slightly. Open and click-through rates both saw a slight increase over Q4 2017, as well as, Q1 2017. Triggered email trends were compiled from approximately 3.8 billion triggered emails sent from January 2016 to March 2018, across multiple industries. These messages were sent as the result of a consumer action, such as Welcome, Thank You or Confirmation. These metrics also highlight significant performance differences between triggered and BAU emails. Triggered messages accounted for 4.6 percent of total email volume in Q1 2018, more than last year (2.7 percent) and in Q4 2017 (3.1 percent). Triggered open rates were 60.2 percent higher than BAU in Q1 2018. This was lower than the Q1 2017 (same quarter last year) increase of 69 percent over BAU. 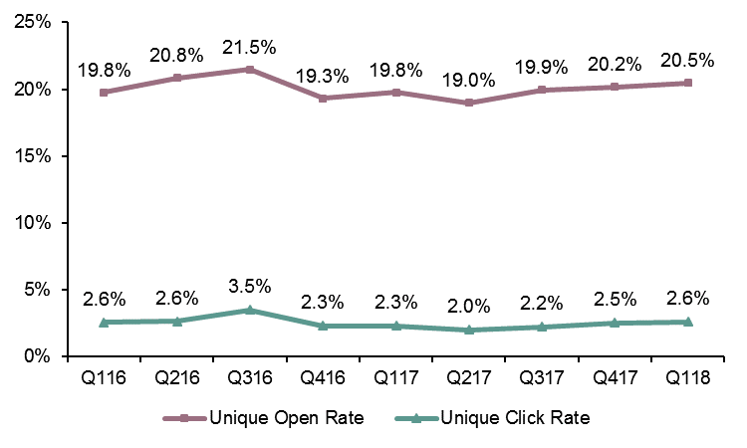 Triggered click rates continued to perform well in Q1 2018, showing a 91 percent lift over BAU. As email continues to be an effective channel to reach consumers, now is the time to invest in email marketing efforts with advanced tactics and tools, like machine learning, to deliver truly personalized experiences in the moments that matter most. Start by having the right assets in place to support personalization, including the data to drive machine learning and an email template that can accommodate dynamic content and those machine-made decisions. For more insights download the full Q1 2018 email trends and benchmarks.